What i should have added is quite a number of points. how about that man Carl eh? Few more performances like that and he’ll either get us a decent transfer fee, or provide an upgrade on Lichtsteiner as a rotation option/back up to Hector! Spurs away this weekend. I think we’ll see Emery stick with 3 at the back. Rotation continues to be key, and while I enjoyed Ozil today you’ve got to imagine he won’t be asked to back it up again. Still leaves Ramsey, Lacazette, Suarez, Guendouzi as options off the bench. Really should have won that. Absolutely shafted by the ref. Auba should have rendered all that irrelevant tbf, even then we were shafted again. 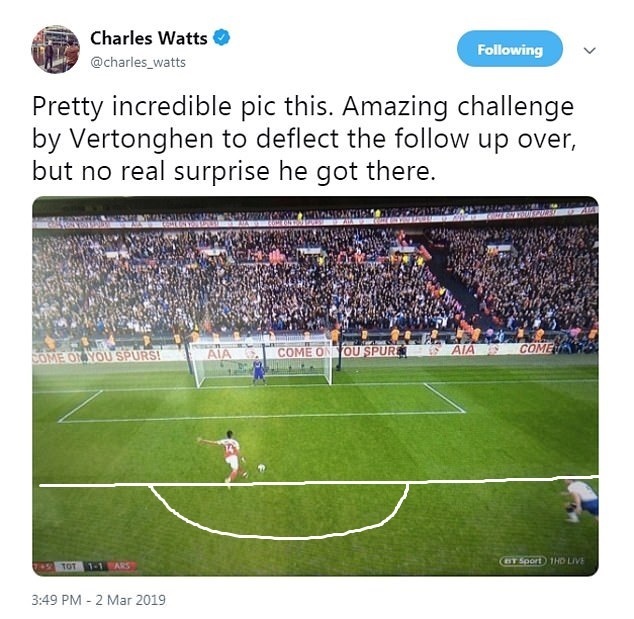 How far inside was Vertonghen before the pen was taken? Good performance though. If we beat the Manc scummers next week i think we're all set for 4th. How does Rose not get a red when Torreira does as well? Refs were shocking. We shoulda had all 3 from that. Got lost in all the uproar but how good was Leno's double save btw??? I woulda taken a point before the game, Auba/Laca were guilty of a lot of missed chances, but that was still really tough to swallow. Oh yea and Mkhi is looking proper good right now. Meanwhile Sanchez may have done his knee this morn. What a deal we got there in the end. Xhaka should’ve been sent off 10 minutes in. Ref was poor but he was poor all round. Got a clip? I know Xhaka has his moments but I don't recall anything worthy of a red. Rose was just a c*nt all day, deserves yellows for how willingly he hits the ground. Torreira's was justified, but as you say Paul, Rose went two feet straight into Leno's chest. They also missed the lash out on Kosc from Sanchez too. Oh well, when you get a penalty at the death like that and you don't take it it's all on you! We had chances but weren't good enough to get the job done. Watching that felt like a late-Wenger performance where we were one up but too passive and allowing the opposition to dictate terms and eventually conceding. That's a fascinating bit of the law I was not aware of. Mustafi's lean in there was absolute mad, especially with Koscielny on the cover. On Xhaka's tackle the ref was letting a lot of that go, he was consistent to both teams but wasn't firm enough on any of these views. Until the 94th minute that is. The encroachment on our missed peno was missed too, certain goal if that player was not there to clear it, he was nearly level with aubameyang when he hit the penalty. Massive miss by the refs there that cost us the game as well. Yes brumbys the sanchez stamp also a red card offence. Very unlucky to only take a point from this, whichever way its spun. Oh well, draw not the worst result i guess, I would have taken that before the match. Also brumbys, after watching that, I'm keen for Jenko over Mustafi at right back, that's for sure. Not even talking about the peno either. The man is a shambles. He actually did a lot of stuff right in terms of positioning etc, but he always spoils it with dumb fouls or bad touches. He can't seem to iron it out of his game. Interesting that Emery isn't a fan of Maitland-Niles at RB, he was fully fit right? I have come to the conclusion that Mustafi is simply a fudgeing idiot. Buffon II and brumbys endorse this! It took me a while valeo, but I am there too. The reason it took me a while is that he seems to have all the ingredients - he's fast, he's strong, he's got good feet, he's good in the air. I think there are parallels with Lovren. He looks like he's got it all in his locker, but you get brain explosions all too frequently. You see some of his crap with young defenders, but he's about to turn 27, and it doesn't seem to be getting better. I did find the RB selection odd. With AMN back and on the bench I'd have thought he'd be a shoe in. That said he isn't strong defensively, and reverting to a back 4 with a game plan of shutting them out you want a solid defender there. As much as Mustafi's a mug I think he got the decision right, as we were very much under control bar his absolute brain fart. I guess what I'm saying is if Jenko or AMN play in that position in that game I think Sp*rs might have had more luck through that channel. I'm genuinely hoping Jenkinson get's a run of matches under his belt now. I know he's been written off but whenever he's played he's looked fit enough, defended well, and offered more on attack than AMN, Mustafi, or Lichsteiner.